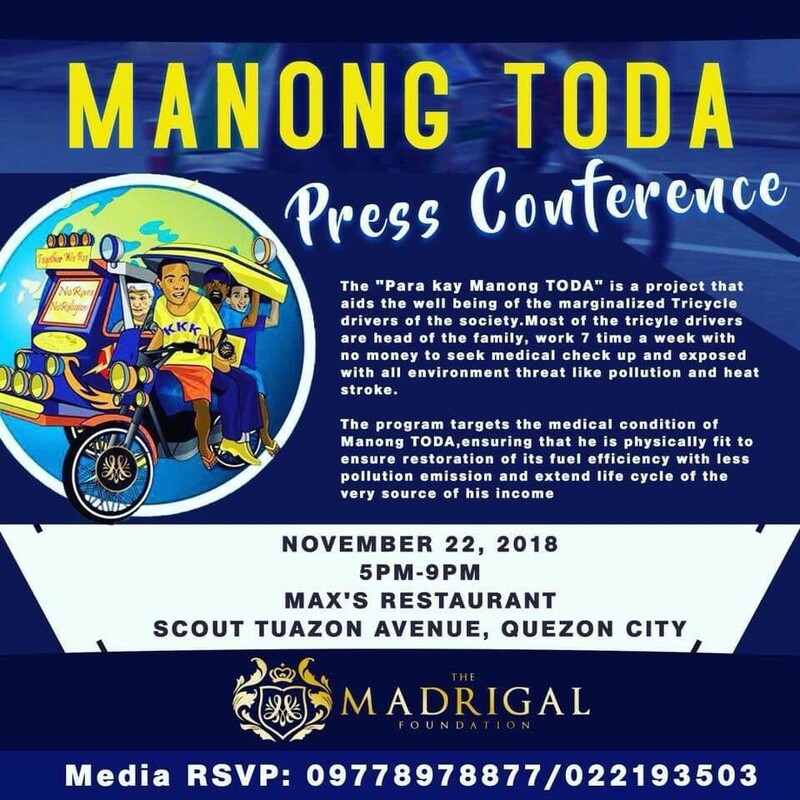 On November 22, 2018 from 5:30PM to 9PM, The Madrigal Foundation headed by Ms. Patricia Madrigal with its partners will launch “Para Kay Manong Toda,” an Advocacy campaign to help our marginalise tricycle drivers to help them alleviate their lives by being heard through forums, seminars and press conferences by inviting government officials and private sectors as panelist’s and speakers. That way, the Foundation is hoping that at least some of their needs will be heard by means of these awareness programs. The event will be moderated by PTV Anchor Emelie Katigbak and Manila Times Business Writer Engr. Grace Bondad Nicolas. The “Para Kay Manong Toda” aids the well being of the marginalised tricycle drivers. Most of the tricycle drivers are head of the family and works 7 days a week to support their loved ones, without health insurance and most doesn’t receive benefits from the government. These modern day heroes are exposed to pollution and environmental hazards daily. One of the program under this project is to seek help to focus on their working and medical conditions. In this way, these heroes can continue helping their families and the society as well giving good and safe transportation to those in need. The foundation believes that information dissemination is one way to be heard.